We have 4 Weeks of television between Night Of Champions and Hell In A Cell. Let’s start from the RAW after the Pay-PerView. Opening Segment: Brock comes out with Heyman and his goons (the Paul Heyman guys, who all lost last night no less) in order to gloat, but before he can even finish his first sentence – JOHN CENA’s music hits (this should make things more interesting than waiting until the final segment where we would all inevitably expect him, and that’s boring). He runs to the ring, clears it of everyone (Axel, Ryback and Cesaro) before staring down Brock again, shaking with fury. But strangely, he backs out of the ring still shaking with fury (this ought to leave the people confused, especially Heyman, but Lesnar could laugh it off). Nothing else for the rest of the night from John, just a backstage segment with Heyman discussing what just happened, who is clearly confused but very much intrigued by the situation. Starts conversations about whether we think Cena is scared, too afraid to fight Lesnar. What could it be about? Week 2 – RAW Opening segment: Piper’s Pit with John Cena and Paul Heyman hosted by Roddy Piper. THIS is where we start talking about the need for John Cena to go to somewhere far darker in order to beat Brock Lesnar. The speculation surrounding Cena is that he left the ring last week because he was scared. And he was, he was scared of what he was going to do to Brock that night. He did not want to show that side of himself. Paul feeds on this and begs for it to come out. Piper sides with Heyman and tries to egg Cena on, willing him to be true to himself and show these people what he really can do. Cena backs out, saying he will never do that. That he has too much responsibility, too much to lose from being selfish. If he comes out looking like a thug, he will let down the millions of people who look up to him. Piper tells him that if he doesn’t tap into that selfishness, that ego, that side of desire, then he won’t ever beat Brock Lesnar. We later discover that John is not medically cleared to compete until Hell In A Cell at a later point in the show. This means he will not be on RAW next week as he needs to be retested. SIDE NOTE – This will be a fitting second installment into the dark saga of John Cena, after the feud with Bray Wyatt earlier this year. I wouldn’t want it to be the last installment though, I’d prefer to have a three-act set-up in order to have Cena turn into a vicious monster at the right time, and this might not be the right time. Week 3 – RAW Paul plays on the fact that Cena cannot compete before Hell In A Cell to the following effect: John cannot get his frustration out beforehand, he cannot vent through anyone else. Anything that he wants to do will have to be in HIAC, or if he doesn’t – he’s going to face a killing like he did the last time at Summer Slam. But this time, it will be even worse. Because Brock will wring his neck just like any mere chicken in his farm, because inside the meshed gate, when they find themselves trapped in, Brock will prepare his feast in that steel cages. This is his hunting ground, brings back the killer instinct from his MMA fighting days, and that switch might just go off again inside – to go in the for the kill as soon as he smells blood and not stop. Although in MMA, the referee stops you and the fight is over. Inside The Cell, there is no referee stoppage, there is no disqualification. Brock Lesnar might just end more than John Cena’s career. We see a video package about John Cena healing and watching Night of Champions with Lesnar v. Jericho at his home, and we see the uncontrollable anger that comes over him during it. We then cut to him in a hospital, where the doctor informs him that he is physically fit again, but he has some real psychological concerns to overcome. We then see Cena go back to his house, visibly concerned but with an air of determination, he goes back to working out. It is announced that Cena will appear on Smackdown! to answer the WWE Universe. SMACKDOWN! John Cena comes out to talk to the people – he talks about how furious it made him to watch Lesnar defend the WWE Championship, and to victimise Jericho. Because it brought back the feelings of helplessness that went through him during the match, the fact that at every turn he kept trying to fight back but couldn’t do a damn thing. And it pissed him off, but there’s a dozen Make A Wish kids out there, who he doesn’t want to let them see that in their last moments, the guy they looked upto was no better than a thug. Week 4 – The final RAW, a week before the Pay-Per-View. Paul Heyman’s promo: chastises Cena for his inner ‘thug’ – he brazenly put it on display. It was his thuggishness that allowed him to reach the success he has. Calls Cena a hypocrite. He goes on talk about the successes of his client. Brock has never lost in HIAC – and he faced The Phenom. 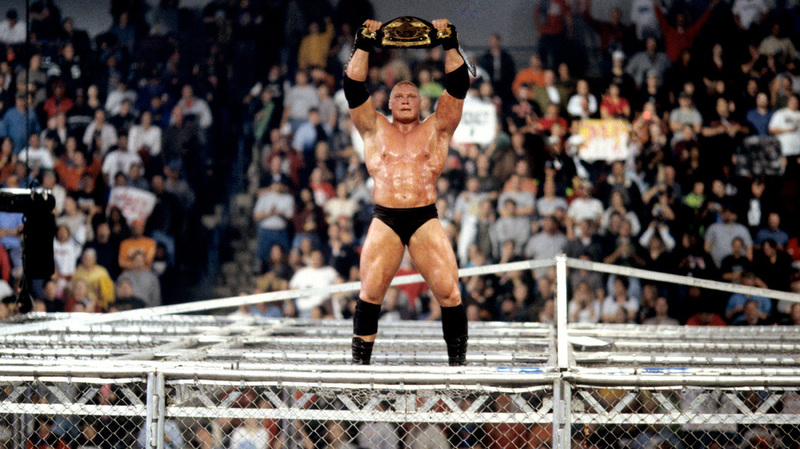 He has never been pinned or submitted in a steel cage in WWE – v. Heyman / v. Vince / v. Triple H. What could Cena possibly do? He should just try not to catch his jean shorts in the metal structure, that will be hard enough for him. Await an answer, nothing happens, Cena doesn’t show up for the big confrontation. Throughout the night, we see Cena attack Paul Heyman Guys – Cesaro / Ryback / Axel without mercy, completely destroying them. He throws RyBack off the stage, he chokes Cesaro into submission and AAs Axel through both announce tables, one after the other in quick succession (don’t drag it out like you usually do, people are programmed to expect the announce table and so just doing it once and trying to make it look really dramatic just doesn’t work anymore, it’s not that big of a spectacle as it once was). Once he has demolished Axel, he grabs the mic but before any sound comes out his mouth – LESNAR’s music hits, and the Champ just stares at him from the titantron, laughing, completely unfazed by this new Ruthless Aggression. Hell In A Cell PPV – Brock Lesnar defeats John Cena inside Hell in a Cell. Vicious and brutal battle between the two, we see Cena become more and more bloodthirsty throughout the match but he hasn’t tapped into it completely. And Brock punishes him for it. Although Lesnar is thoroughly tested, he wins cleanly yet again. Now, the road goes through Hell in a Cell and to Booking Brock Lesnar – Volume IV – Survivor Series and TLC. Article originally published on Pyro & Ballyhoo HERE on 20/09/14.